Socrates of Athens (460–399 B.C.E.) was both a real historical person and the main character in Plato’s dialogues. In both modes, he perfected the methods of the Sophist’s in rhetoric, argument, and dialogue, but as a character in Plato’s later dialogues he appears mainly as a mouthpiece for Plato’s abstract philosophy. While there is some controversy about how much concerning Socrates, the philosopher, was invented by Plato, there is stable agreement about certain facts of his life. All agree that Socrates lived the principles he taught, the most famous being, “The unexamined life is not worth living.” Socrates’ father, Sophroniscus, was a stonecutter from Alopeke; and his mother, Phaenarete, was a midwife. Socrates himself was fond of referring to his philosophical manner of discourse as a form of midwifery. In Plato’s Meno, he uses this role to extract mathematical truths from a slave boy as proof of the presence of innate ideas in the soul, which are first acquired in a divine realm before birth. Sophroniscus was friends with Athenian general and statesman Aristides the Just (530–468 B.C.E. 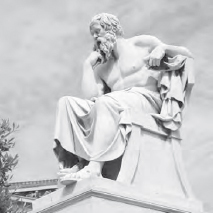 ), which helped Socrates become connected throughout his life with the leadership class of Athens. He served ably and courageously as a hoplite (infantryman) in the Peloponnesian War (431–404 B.C.E.). When he became absorbed in philosophical activities, however, he became poor. Socrates’ wife, Xantippe, was depicted as a shrew in later writings about him, but he cared for his young sons, and asked his friends to provide for their (Socratic) education after his death. Socrates was condemned to death for “not believing in the gods the state believes in, and introducing different new divine powers; and also for corrupting the young,” according to the indictments related in Plato’s Apology and Xeno - phon’s Apology. He died peacefully by his own hand, drinking a cup of hemlock in preference to the escape arranged by his friends, which would have resulted in a life of exile. He refused exile because it was dishonorable and because he had voluntarily lived in Athens and accepted its laws throughout his life. To desert his city so as to avoid death would be disloyal in his mind. Socrates said he did not fear death, because he knew nothing about it. If there were no afterlife, dying would be like falling asleep, and if there were an afterlife it would enable a higher stage of discourse—it would be heaven. Another interpretation is that Socrates did not have much to lose by dying—he was already an old man. A statue of Socrates is located at the Academy of Athens in Greece (iStock).